These two books have provocative titles and challenge us to assess the legacy of the British Empire. What more appropriate time to do this than now when the Commonwealth Heads of Government are meeting in Kampala! They should be read together as the first book provides the historical basis for the second. Pulford, a journalist who enjoys writing about Africa and current affairs, is strong on alerting us to the latter, but is biased on the assessment of the history of Uganda. Unfortunately he prefers to rely on the reinterpretation of the first-hand evidence by modern writers rather than on the evidence itself. He does however quote verbatim from the writings and statements of such exciting people as Livingstone, Stanley, Speke, Mutesa and Mwanga, Kamurasi and Kabalega, Emin Pasha and Casati, Lugard and Mackinnon. This makes the first book well worth reading, particularly for those who have served in East Africa. The author also lists the arguments on both sides leaving the reader to make up his or her own mind. Eating Uganda quotes an African proverb which means taking control of the country. The sub-title is From Christianity to Conquest, but is that fair? Pulford starts correctly by describing Stanley's famous meeting with Livingstone at Ujiji in 1871. It was a defining moment for Stanley the explorer. He would devote his life to Africa and subscribed to Livingstone's mission statement of Commerce and Christianity. It was this which Stanley presented to the British people when he sent his famous letter from Kabaka Mutesa's court in 1875 published in the Daily Telegraph: What a field and harvest ripe for the sickle of civilizationl. That prophetic vision was indeed fulfilled through the valiant efforts of the three main characters described in this first book, namely Stanley the determined explorer, Mackay the practical Christian tutor, and Lugard the soldier administrator without whom there would have been no Uganda Protectorate. Stanley opened the door for the missionaries of the Church Missionary Society to come, Mackay the courageous Scottish Presbyterian translated St Matthew's Gospel into Luganda for all to read, and Captain Lugard was the brilliant commander who collected the beleaguered Sudanese soldiers from Western Uganda after fighting off the attacks of Kabalega the Omukama of Bunyoro and the inveterate foe of the Baganda and the British, and with them and his maxim gun saved Buganda from complete chaos and disintegration. The Protectorate was declared in 1894 and the Uganda Agreement was signed by the three Kingdoms of Buganda, Ankole and Toro in 1900, enabling the development of democracy and justice and nationhood in Uganda to take place. Unfortunately Kabalega would not sign this Agreement and that led directly to the lack of development in Bunyoro. It led to the whole problem of the Lost Counties and the fact that Bunyoro had no organized system of land tenure as happened in Buganda with Mailo land, until 1933 when Bunyoro did sign a Treaty. 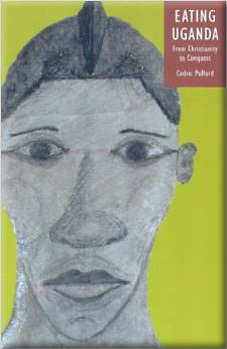 For the present grandson of Kabalega to announce a plan in 2004 to sue the British Government for alleged war crimes committed in between 1894 and 1899 on the basis of a book written by a serving British officer in a light-hearted vein entitled African Incidents and published three years after that officer's death is surely ludicrous, particularly as compensation for #3 billion pounds is demanded. 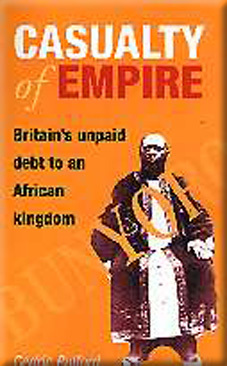 It is hard to see the rationality behind Pulford's attempt in his second book with its sub-title Britain's unpaid debt to an African kingdom to elevate a minor war precipitated by Kabalega to the status of a casualty of the British Empire. The evidence just does not support such a claim. However this second book is worth reading if you want to see how some people today want to denigrate the valuable bequests which the British Empire has given to the world.